One gorgeous spring afternoon, my husband walked in the door of our Richmond, Virginia home and announced that he had just gotten a spectacular job offer. An offer he could not in good conscience turn down. This must be a really bad April Fools’ joke, I thought bitterly. But apparently he was deadly serious. “What the HELL?” I snapped, my East Coast snobbism kicking into high gear. The Midwest? The FLY OVER ZONE? Do they even have electricity there??? As it turned out, the job offer ultimately WAS too good to turn down. This was 2008 and Virginia, like many other states, had quickly descended into a deep economic recession. The kind of job my husband wanted in the financial industry was at that point almost impossible to find in the South. I had a successful fundraising consulting business in Richmond, my immediate family all lived there (my sister just two doors down from me), and my children were happy in their respective schools. Richmond was and still is my “happy place.” I love the culture, the food, and the history. But now it was time to put on my big girl pants and take one for the team. So we moved in August of that same year, with me crying into my Starbucks cup all the way to Iowa, freaking out and generally thinking my life was over. It did not help that my father had just died unexpectedly. And I was about to turn the dreaded 4-0. In my mind, 2008 was turning out to be my Annus Horribilis. My Horrible Year. A few months later, the tears had dried, I had the kids settled in their new schools, and we had moved out of a dreary corporate apartment into a lovely home. I decided I was done mourning my old life and former job. It was time to get over it. I had moved successfully before, to Charlotte, N.C. where I had jumped from teaching into the museum work that I loved. It had been a big turning point for my career, I suddenly remembered. This move, I decided I would do the very thing I had been avoiding doing for about 15 years: writing a biography of a Southern historical figure that my museum career and educational background had completely prepared me for. In my hometown, I was always way too busy to do it. I knew too many people, was on too many volunteer boards, and I had too many family obligations. Now I was something I had never been: anonymous. And I could do whatever the hell I wanted! Woo hoo! So I did. I buckled down and made lemonade out of lemons, bloomed where I was planted, and came to love my new hometown of Des Moines. Which by the way has not only electricity, but also a surfeit of creative culture, great schools, and highly educated people. Here, I have met some of the best friends I will ever have anywhere, joined the Art Museum as a docent, and attended the Iowa Summer Writers’ Workshop. I have also skied in Colorado, been to Mount Rushmore, and shopped the heck out of Michigan Avenue in Chicago. More than once. 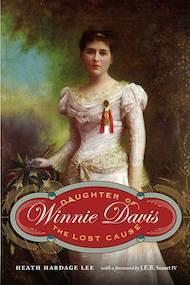 Oh, and I did finally buckle down and write my book: Winnie Davis: Daughter of the Lost Cause, which was just published a few weeks ago by Potomac Books, a division of the University of Nebraska Press. I think, ultimately, it took moving to the Midwest to gain the perspective I needed to write this biography. I needed expanses of time, as well as some distance from a subject I knew perhaps too well. 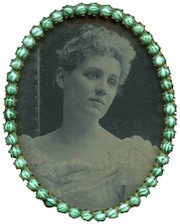 As I write in my book’s Acknowledgments, “Writing about Winnie has been a therapeutic way to stay connected with my southern past.” That past is an inextricable part of me, but getting away from the South and my home allowed me to flourish as a writer, an historian, and an independent woman. I think Winnie, who also left the South to pursue her writing career would be proud of me for making the move. She became the best version of herself in New York City. I can only hope the same transformation has occurred for me here in Des Moines. Heath Hardage Lee has worked in the fields of museum education and historic preservation. She has also written for numerous magazines, newspapers and blogs. 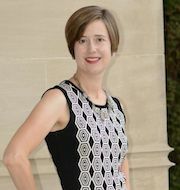 Winnie Davis: Daughter of the Lost Cause, her biography of the daughter of Confederate President Jefferson Davis, is her first book.